I see that Prince Charles and Camilla recently had a tour of Jordan. It may have been a bit bumpy but I suppose if the call comes, as a loyal subject, one must comply. So this morning I shall be on my way to the delights of Gatwick airport and then on my way for the far more convincing delights of Nice Airport and then home to Valbonne, forsaking my duties today in respect of Currencies Direct. Ideally I should have an early night this evening and avoid strong drink, but we are staying in our house with Peachy Butterfield for Christ’s sake, so you should know what would one expect. If you do not then I will tell you; he will have procured at least two boxes (yes boxes not bottles) of wine, each of at least 10 litres which he likes to call card Bordeaux. It will taste execrable, at least for the first few glasses, after which one’s taste buds are anaesthetised to the point where you don’t notice. If things go really badly then the Limoncello will be brought out and all decorum thrown to the wind. With this in mind, and with another go at the 600 calorie diet yesterday, I saved enough calories up for one glass of wine before bedtime, and crawled into my sack just after midnight after watching some cricket. A teetotal night before a Peachy onslaught would be dangerous. I have packed my launch shoes and am carrying about 70 copies of The Valbonne Monologues with me for the launch on Friday, just in case the courier which was due to deliver them to France today, is further delayed because of the snow. I will not panic, but I will have long arms tomorrow, having to drag all those books on to an aeroplane. It has meant that we have had to reduce our wardrobe that we shall be taking, and as you can imagine, this has not amused That Nice Lady Decorator. I mention launch, because the Wingco seems to have it in his head that he will be launching pages from the book in the form of paper aeroplanes, if he should ever get his hands on a copy. That should happen on Monday, when he returns to France having attempted to avoid the furore over the launch, by inventing a reason why he had to be in London for the weekend. Of course, he will need to procure a copy before it can be abused. 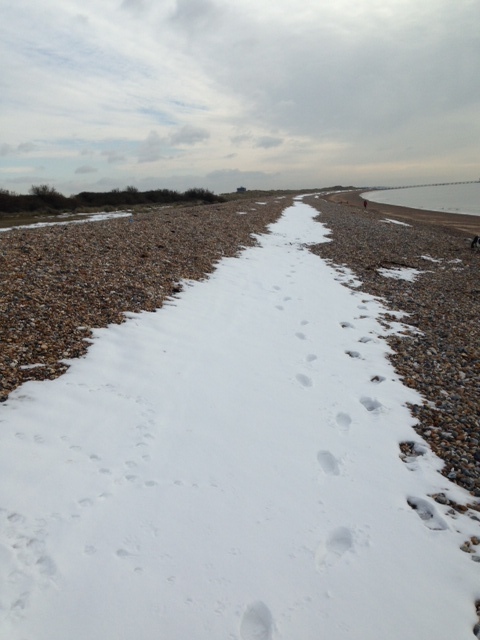 My picture today is of a curious phenomenon I don’t think I have ever before seen snow on an English beach. Much of it has melted today, but I managed to get this picture, which illustrates how bad was the weather yesterday. I am hearing that people took 3 hours to travel 3 miles on Wednesday evening, during the time when I was videoing Sprog 1 tobogganing down Arundel Hight Street, something that I would suggest seldom happens. It did not end well and I was worried enough to walk up there this morning to see what damage had been done to the lamp-post. The damage to Sprog 1 was painful but did not require surgery. I see more poetry seems to be cropping up on the comments section of this column. Please do not encourage them, it is a shameful attempt to climb aboard the roller coaster of publicity that has been created in my own mind for the book launch tomorrow. I am looking forward to seeing a number of old friends this weekend, some of whom I hope will be clutching money to thrust in my hand to buy a copy. The break even is over 200, but they are more expensive than last time because of the pictures. I live in hope. Un nouveau Pape est élu. Well done Winnie-an international ‘Poets Corner’-even better !! I suppose Jordan can now claim to have pyramids as impressive as those in Egypt ! Who we can gawp at on Google Images, right ? With pound upon pound of their huge crinoline. Like Alp upon Alp that in majesty rise ! Sorry Patrick we are obviously two ‘Giza’s’ who think in the same puerile way !! Nice verse though. Good site you have here.. It’s difficult to find high-quality writing like yours nowadays. I seriously appreciate individuals like you! Take care! !